I have been sewing again! A few months ago, I bought several sets of charm squares in Christmas fabrics. I was thinking about making placemats for our kitchen table. 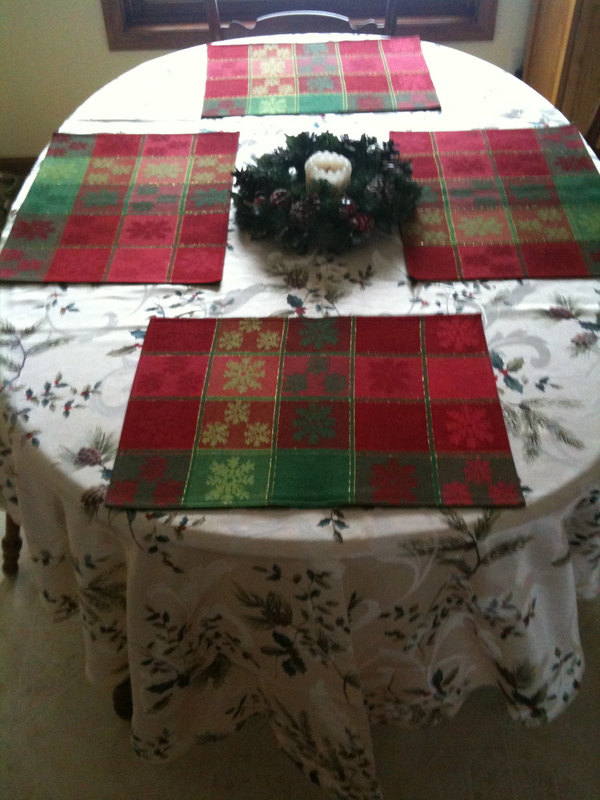 After finding a nice tablecloth at a department store, and discovering a set of placemats in our Christmas decorations boxes that we really like, I decided not to make those placemats afterall. 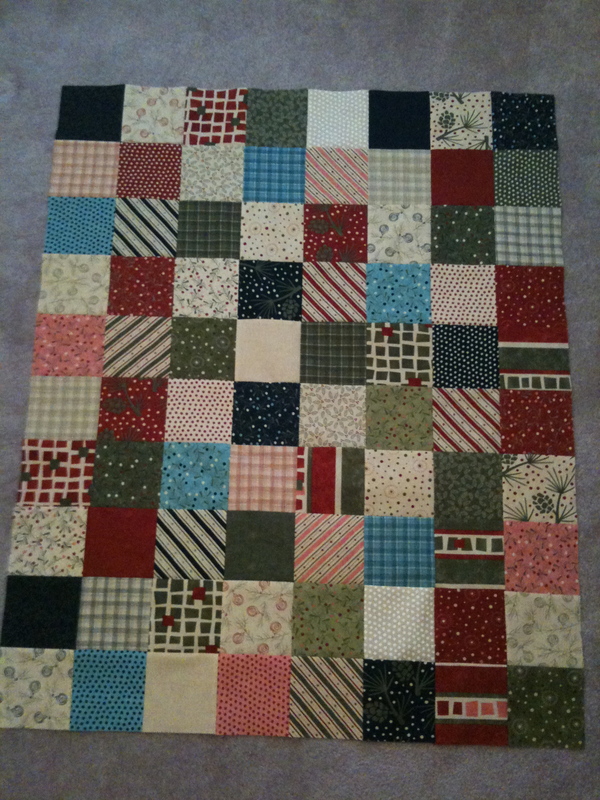 In stead, I am working on two patchwork quilts. The first quilt top contains two sets of Figgy Pudding charm squares. 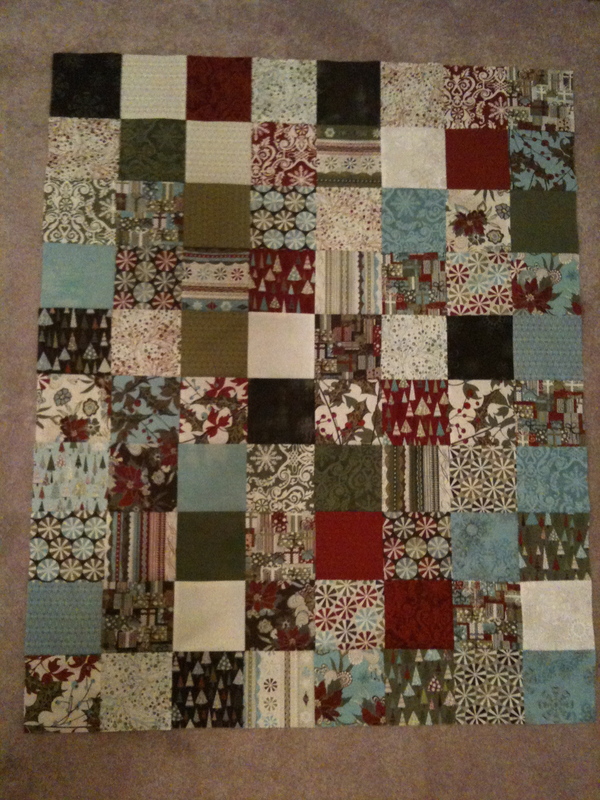 The second quilt top consists of two sets of Crazy Eight charm squares. Aren’t they fun? I am happy with how these turned out! I also like that both of these sets included solids in their collections, making it easier to match contrasting colors. 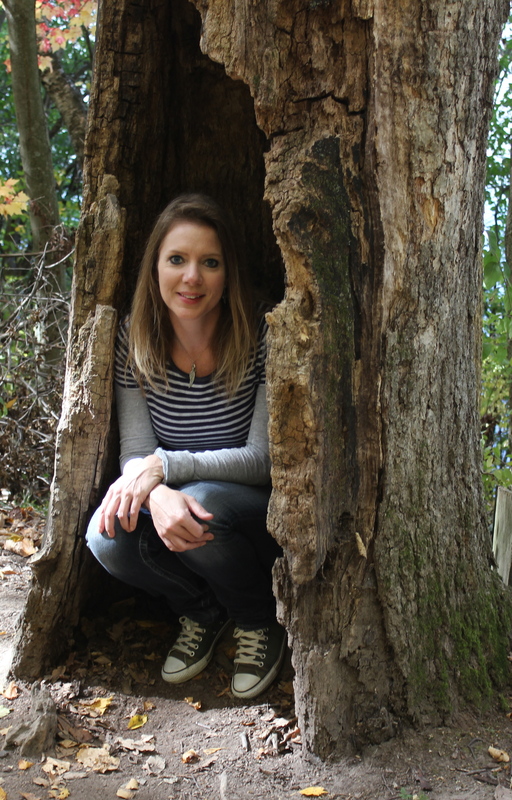 So far, they measure 36 inches wide by 45 inches tall, which seems a little to small for an adult to use. To make them bigger and more useable, I need to shop for solid fabrics to add a couple borders. Oh darn, I need to go fabric shopping! How nice to be working on these simple , no-pressure patchwork projects during the busy holiday season! Don’t you hate it when you need to go fabric shopping? Your quilts are cute! I like the Figgy Pudding fabric. Your placemats are beautiful. Looking like Christmas at your house! I need to work on making our house look more like Christmas! All the Christmas lights here are so pretty with the snow. Wow…those Christmas quilts are great…and yes, you’ll have a lot of fun shopping for borders! I have really been thinking on some simple square quilts like these myself. Yours look great! Don’t you just love the Figgy Pudding Christmas fabric!! I love how your quilts are coming out, I can’t wait to see what choose for the borders! Terri, they are gorgeous!! I love them lots. 🙂 Feel so festive just looking at youe christmas quilts! Have a lovely merry happy week and love to you! They are looking great! Happy Shopping! Cute quilts Terri.. I love the Figgy pudding fabric. I’ve been busily sewing Christmas table toppers, yes and stressing myself to finish. Can’t wait to get back to finishing UFO’s after the holidays. Cute! I love simple Christmas quilts, decor etc., Figgy Pudding is definitely my favorite Christmas line this year!